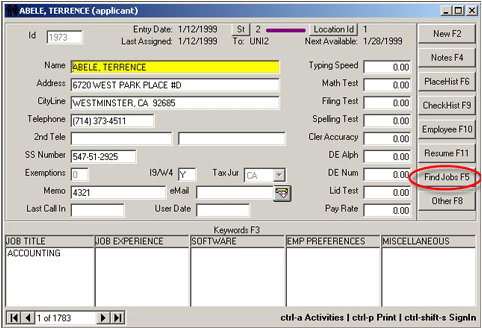 Choosing the Find Jobs – Skills Profile, F5 button, on the applicant screen, will present a dialog box with choices of how to search for job orders for which the applicant is qualified. 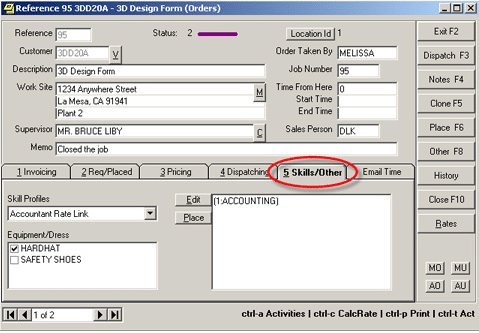 The Find Jobs – Skill Profiles, as seen below, searches Find Jobs – Skill Profiles, which are setup on the “5 Skills/Other” button on the job order screen. Find Jobs (Skill Profiles) are groups of criteria that are created much like using the “Search” feature from a blank applicant screen.